Maximum 700mm/28.5" arm extension allows mounting anywhere, even in or near corners. 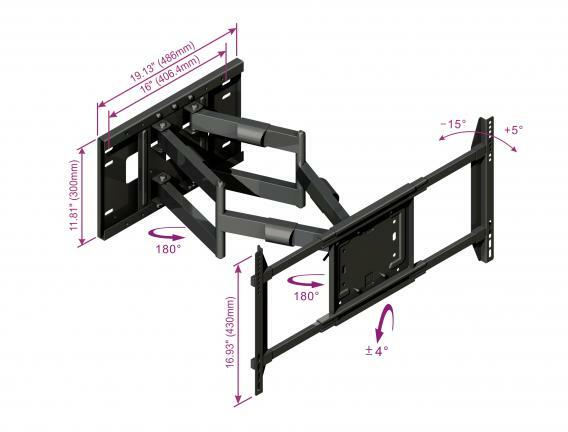 Some customers who were planning to buy a large tilt mount, say for mounting above a fireplace, can be stepped up to the Rocelco VLDC because it pulls out to allow easy cable access, pushes in almost flat to the wall, tilts down like a tilt mount, and swivels side to side for different viewing positions. It’s also perfect for recessed mounting where the TV needs to be pulled out from an inset mounting position. Double cantilever design for the ultimate in smooth, stable and precise positioning of large flat panels, including easy front-to-back movement. Cantilever arms can mount in 5 different positions on wall plate for left corner, center wall or right corner mounting. Folds flat to wall to save space. Heavy duty steel construction, easy installation, attractive black finish. Fully assembled for fast easy installation. Just mount interface to screen, install mount on wall & hook screen to mount. Bracket Dimension Width: 19.10" Height: 11.80"